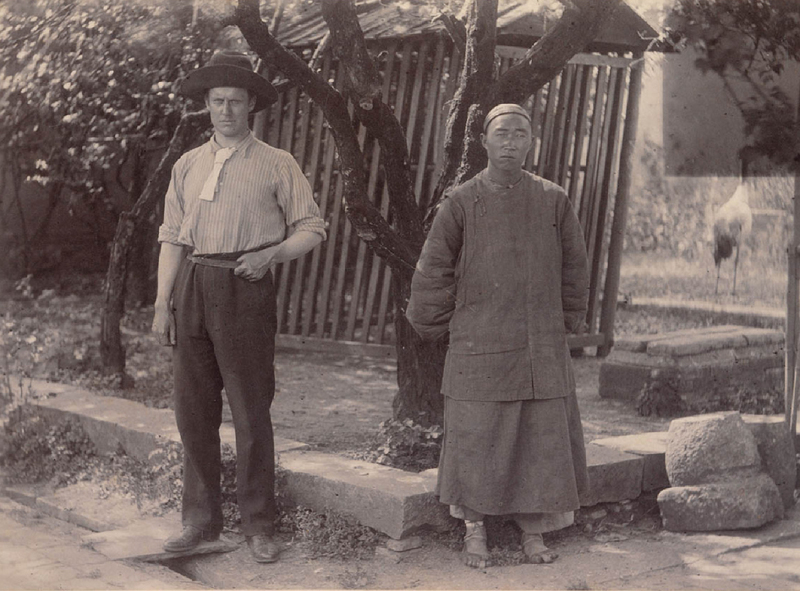 George E. Morrison and a Chinese staff member, possibly in the backyard of house. This is a transcript of the lecture “Morrison’s World,” delivered by Linda Jaivin for the The 72nd George E. Morrison Lecture, on July 13, 2011. The transcript was first published by China Heritage. In my own work I have trespassed on what may be for some members of this audience the most sacred ground of all, the world of George E. Morrison. My historical novel A Most Immoral Woman tells the story of Morrison’s passionate and unconventional affair with Mae Perkins, an independent and wealthy young American libertine, in 1904. It’s a tale that roams the landscape of a dynasty in decline, looks out over the battlefields of the Russo-Japanese War, and imagines a time when a woman’s forthright sexuality could be considered far more shocking than any transgressions of empire. When George Morrison was born, in 1862, Australia was a continent, not a nation. His birthplace Geelong was part of the Colony of Victoria, named after an English Queen who was 25 years into her reign over an empire on which, it seemed, the sun could be relied never to set. Yet change was in the air. Fourteen years earlier, Karl Marx had written The Communist Manifesto. Darwin’s On the Origin of Species had been in print three scandalous years, and Baudelaire’s Les Fleurs du Mal five. The final chapter of Dickens’ Great Expectations only came out the year before. Freud was five years old, Oscar Wilde eight. Europeans had been living on this continent for less than one hundred years. The plagues of smallpox and violence they visited on the people whose land they occupied had fatally eroded an initial spirit of mutual accommodation. Although the so-called “Frontier Wars” had ended, massacres and mistreatment of Indigenous peoples had not; a particularly shocking mass murder of Aborigines occurred in Maryborough, Queensland just two years before Morrison was born. The colonists’ unease and fearfulness about the harsh Australian land itself had been brought to fever pitch the year before Morrison’s birth, when the expedition of Burke and Wills from Melbourne to the Gulf of Carpentaria and Coopers Creek ended in a fatal shambles. The boarders’ families could afford such luxury. It was boom times in Victoria. In 1851, gold had been discovered at Ballarat and Bendigo. In the decade that followed, miners extracted some 20 million ounces of gold there, one-third of the world’s total output. In that great land to the north, a five-year-old emperor, the Tongzhi Emperor, sat on the throne. By the time of Victoria’s gold strike, the Taiping Rebellion had begun to cut its murderous swathe through southern China. Times were tougher than usual. When word of this miraculous “New Gold Mountain” (新金山) percolated north, tens of thousands of mostly southern Chinese set sail for Australia. Organized, frugal, and hard-working, the Chinese gave the locals a run for their money on the gold fields. Tensions erupted into conflict and violent anti-Chinese riots ensued. The most serious of these, at Lambing Flat in New South Wales, occurred only one year before Morrison was born. Anti-Chinese sentiment in Australia wasn’t simply the product of competition on the goldfields. In the early 18th century, Enlightenment philosophers such as Voltaire had idealized China as possessing not just a brilliant civilization, but a system of government that, being based on competitive civil service examinations and the ideal of the virtuous ruler, was worthy of emulation. By the start of the 19th century, however, Sinophilia had largely given way to the Sinophobic views of thinkers like Diderot and Montesquieu, who considered China a hopelessly despotic nation ruled by fear. What’s more, as Colin Mackerras demonstrates in his book Western Images of China, by then Britain had taken over as the West’s leading source of images of China—and, for the first time in history, the majority of these images were negative. Theories of race were steadily gaining credence in the West. These held that “color”—pink not included—was a marker of moral and other deficiencies. In his book The Great Encounter of China and the West, 1500-1800, David E. Mungello notes that while in the 16th and 17th centuries, Europeans referred to Chinese as having white skin, by the 18th and 19th centuries, the notion that they belonged to an inferior “yellow” race had taken hold. The fact that the Qing only quelled the Taiping rebels with the help of a British military man, Major-General Charles “Chinese” Gordon, reinforced impressions of China as a barbarous, hapless nation that could only benefit from contact—even enforced contact—with the “civilized” West. I went to China possessed with the strong racial antipathy to the Chinese common to my countrymen, but that feeling has long since given way to one of lively sympathy and gratitude. Morrison was nonetheless very much a man of his age: the Age of Empire. Between 1815 and 1915, Britain increased its empire by 26 million square kilometers of territory in Africa, Asia, and elsewhere, claiming dominion over more than 400 million people worldwide. The French were on the march in Africa and Southeast Asia, a recently united Italy was seeking to expand its influence as were Germany and Russia. It wouldn’t be long before Japan joined in the Great Game. As a boy, Morrison loved reading the Illustrated London News. The subscription reached them by sea mail; his parents might still have had copies showing artists’ impressions of the razing and looting of the Garden of Perfect Brightness, Yuanming Yuan (圓明園), or other scenes from the Opium Wars with which the British had punished China for its lack of interest in their nationally-sponsored drug trade. At 16, Morrison’s favorite book was Coomassie and Magdala by the explorer H.M. Stanley. Stanley would go on to track down Dr. Livingstone; Morrison would go on to find his ultimate literary hero in Rudyard Kipling, the “prophet of imperialism,” the author of the iconic The Jungle Book and Kim, among other novels of empire and poems including Gunga Din and The White Man’s Burden. It’s easy in retrospect to see the falseness of notions of “discovery” when applied to long-inhabited places, or to perceive how outrageous was the practice of “exploration” when it involved invasion and wanton souveniring. The actuality of bullying, invasion, and exploitation today make the official rhetoric of the British Empire that it was a “civilizing” force sound hollow. But there’s no indication that Morrison was anything but sincere in his belief in this mission. While still a teenager, Morrison tested his endurance and mettle in the bush, in the outback, and on the rivers of this continent, paddling the Murray solo in a canoe and re-tracing Burke and Wills’ fatal route. When he took off to see the wider world, whether it was to attempt to walk across New Guinea, try his luck as a physician in New York, or simply sample the carnal delights of Madrid, it was with the cockiness of youth, the confidence of the hero, and the knowledge that he was an Englishman, one of the world’s ruling tribes. Morrison’s ability to travel to such far-flung destinations as the British Isles, Jamaica, the U.S., France, Morocco, the Philippines, and of course China was greatly aided by the technological advances in railways and steamships over the nineteenth century. The marriage of compound steam engines, steel hulls, and screw propellers had whittled weeks and, in some cases, entire months off intercontinental ocean voyages. Around the time Morrison was born, the Frenchman Louis Vuitton came up with another idea that would revolutionize travel: lightweight, stackable luggage. A few weeks ago, a friend traveling to China for the first time texted from Shanghai to ask where she could buy deodorant. I texted straight back suggesting a Mannings or Carrefour. In Morrison’s day, you wouldn’t want to have forgotten any necessity, whether it was your camp fork, shaving kit, rubberized raincoat, or toothbrush. Especially your toothbrush—until the late 1800s they weren’t even easy to find in the U.S. On the other hand, a toothbrush may have been one thing you could safely count on getting in China. It’s believed that like paper and gunpowder, the bristled toothbrush was invented in China, spreading to the West from there. Morrison, who has given us extraordinary access to his world thanks to the journals he kept almost to the day he died, would also have needed to pack a pot of ink, a supply of blotting paper, and spare nibs. At least he didn’t have to worry about quills: metal fountain pens, patented in America in 1810, had come into mass production the year before he was born. As for clothing, it was an age when people dressed for dinner: even Morrison, famous for his relaxed, even bohemian approach to fashion, would have had to pack a presentable selection of collars and cuffs. Women’s kits took a bit more space: a single outfit for a Western woman in the late 19th and early 20th century could consist not just of dress, hat, gloves, stockings, garters, and shoes but a top bodice and under bodice, gored skirt, petticoat, corset cover, busk, corset, chemise, and of course bloomers. If Mae Perkins took a little piece of Morrison’s heart when she finally returned to San Francisco in June 1904, she could have stowed it in any one of her 13 pieces of luggage. Then, of course, were the precautions one needed to take for health. Tuberculosis, cholera, malaria, dysentery, and rabies were rampant in many parts of the world, and easily spread. Notions of hygiene were far from universal and medical science itself was only just coming round to the idea that germs caused illness. Blood tests and antibiotics were things of the future. An 1890 guide for passengers on Orient Pacific steamships advised all travelers to carry essential medicines such as potassium, ammonium, strychnine, morphia, caffeine, chloroform, and cocaine. A man would be also well-advised to pack condoms, or “riding coats” as they were nicknamed. The most common were fashioned from oiled and stretched lamb intestines. As I wrote in A Most Immoral Woman, while these were “fairly reliable at preventing what was known in polite society as an ‘interesting condition,’” they didn’t offer much protection from the “pox.” Syphilis and gonorrhoea were pandemic in the 19th century. Not surprisingly, given some of the revelations in his journals, Morrison suffered from the latter, describing both symptoms and cure in his diary in some detail as well. On his first trip through China, Morrison contracted what was probably bubonic plague, also pandemic at the time. But if there were many things you could get on the road, one thing you couldn’t take, not easily anyway, was a camera. Photography was cumbersome, the province of professionals trained in the obscure alchemy of albumen emulsions and collodion processes. Kodak’s moment came in 1900 with the introduction of the one-dollar Brownie camera—the first that was highly portable, affordable, and easy to use. Morrison would become an enthusiast. For the first four decades of his life, however, he captured his world in words. The publication in 1895 of An Australian in China made Morrison something of a minor celebrity. It so impressed the editor of The Times of London, Moberly Bell, that Bell offered Morrison the job of China correspondent for The Times. Morrison, trained as a doctor, had always wanted to be a member of what he considered the nobler profession, that of the journalist. Steam-powered presses introduced early in the 19th century had enabled, for the first time, the fast and inexpensive production of newspapers for a general readership. The recently deceased News of the World, founded in 1843, and probably not a great argument for the nobility of the profession, was one of these. Another so-called “penny press,” The New York Herald, actually sponsored Morrison’s hero Stanley on his quest to find Dr. Livingstone in exchange for exclusive reports on his progress. A separate technological development had an equally great impact on journalism. In 1844, Samuel Morse sent the first telegraph message in his own code of dots and dashes. It translated as “WHAT HATH GOD WROUGHT.” Then he sent a second: “HAVE YOU ANY NEWS.” Telegraph technology meant that by the time Morrison met Moberly Bell, there was such a profession as foreign correspondent. Morrison arrived in Peking for The Times in 1897. The Chinese capital was a walled city rising out of kilometers of flat countryside like a magnificent medieval fortress, an impression strengthened every sunset when guards shut the nine gates of its broad walls. In the treaty ports and foreign concessions of Tientsin, Shanghai, and Canton, Western architecture, paved streets, and godowns had begun to dominate the urban landscape. Peking was still essentially a Ming-dynasty town with broad avenues and almost one thousand hutong alleys, its central north-south axis commanded by the Forbidden City. No building stood taller than the walls of the palace, though atop the city walls, where Morrison often strolled, it was possible to view the sea of golden tiles that decorated the palace roofs sparkling at the heart of the graceful, grey, low-slung capital. The Inner City—or Tartar City—was the exclusive realm of Manchu and other northern Bannermen, though by the time Morrison arrived, the rules had bent to allow some high-ranking Chinese and merchants to reside there as well. Manchu, Han, or Mongol, all men shaved and plaited their hair in the Manchu style—or risked losing their heads altogether. On the streets, curtained sedan chairs jostled for space with rickshaws, recently introduced from Japan, and native “Peking carts,” mule-pulled cabs that looked like miniature covered wagons. South of Qianmen lay the walled area to which Han Chinese had been banished soon after the Manchus set up court in Peking. The “Chinese city,” as it was known in English, was famous for even more chaotic and colorful street scenes, thriving shops, restaurants, theaters, and brothels. Peking, 1900, from the papers of George E. Morrison. It’s easy to romanticize the Peking of the late-19th century—the lively seediness of Tianqiao; the splendor of Mandarins gathering for their dawn audience outside Donghua Men, the Gate of Eastern Splendor; not to mention the cultured, passionate Dream-of-the-Red-Chambers-lives of the extended families cloistered in their courtyard mansions. When Morrison joined the capital’s community of 500 or so foreign residents, he was the first full-time journalist. Unlike in the foreign concessions of the treaty ports, foreign residents of Peking lived under Chinese law without the protection of extraterritoriality. Nor, strictly speaking, were they allowed to trade. Most were diplomats, missionaries, and scholars. They tended to live in or around the foreign legations not far from Qianmen. When the odd eccentric, such as the polyglot scholar and talented fabulist Edmund Backhouse, chose not only to live apart but to wear Chinese clothes and adopt Chinese ways, this was called “going native,” not an entirely respectable destination. By the time Morrison arrived in Peking, the Legation Quarter boasted banks, bowling alleys, bicycle tracks, a dedicated post office, and even a Swiss-run hotel. At Kierulff’s shop, the first foreign-owned store in Peking, one could find anything from French champagne to darning cotton and saddles—not to mention palace eunuchs and Manchu noblemen among one’s fellow shoppers, one reason such places were tolerated despite being technically illegal. “Civilization” was served, after a manner of speaking, by its own newspapers as well. One, the English-language North China Herald, in an article published the year Morrison arrived, likened the Chinese to a creature halfway between the recently discovered Java Man, Homo erectus, and “civilized man,” saying that when angry, he became “the very picture of an enraged anthropoid ape.” Racialist discourse was just another thing, like trade and missionaries, that followed the flag. My researcher in California, Maida Counts, turned up some interesting background on that subject about Mae Perkins’ host in Tientsin, James Ragsdale, the unofficial American consul. Before arriving in China, it turns out that Ragsdale had been an activist in the “anti-Coolie” movement against Chinese immigration in California that paralleled the anti-Chinese campaigns in Australia. As publisher of the Sonoma County Daily Republican, Ragsdale editorialized that the Chinese were a race which possessed “neither conscience, mercy or human feeling.” They were “monsters in human form, cunning and educated therefore more dangerous and vile.” It is amusing to speculate what twist of fate landed James Ragsdale in China itself—and I do speculate in my novel. 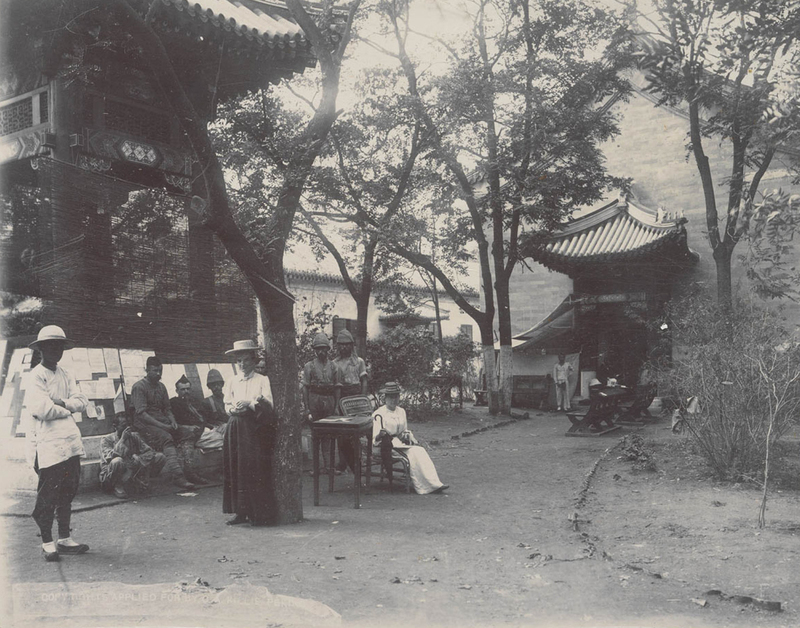 Morrison, who readily availed himself of the social and other advantages of the Legation Quarter and eagerly absorbed and transcribed the foreign community’s gossip, salacious or otherwise, preferred to live apart, settling after 1900 in a courtyard house on Wangfujing. There, he enjoyed sharing the world of his servants, who passed on stories of dealings with minor officials, scrapes with the law, and news from relatives who worked inside the palace or lived in the countryside. He took a warm interest in their families and became close friends with his headman—or head “boy” as he was called. It’s hard today to appreciate the depth of the divide in Morrison’s day between foreigners and the people of China, whether Han, Manchu, or of other ethnicities. There was only limited socializing between the communities. For one thing, Chinese and Manchu were not accustomed to socializing in mixed company—men and women together—whereas Westerners were the opposite. They didn’t much enjoy the other’s cuisines, and if Chinese considered Western manners crude, Westerners tended to find the intricacies of Chinese social courtesies daunting—despite having a reasonably complete handbook in the missionary-authored guide Ways that are Dark, Some Chapters on Chinese Etiquette and Social Procedure. Of course, a deeper obstacle lay in the fact that the very presence of the foreigners in Peking was a daily reminder to its inhabitants of their country’s weakness and humiliation. One of the most dramatic events of the late Qing occurred the year after Morrison arrived in Peking. The 31-year-old Guangxu Emperor (r. 1875-1908) endorsed a program to introduce Western-inspired reforms to the country’s ailing military, political, and economic structures. After 104 days of reform, the Empress Dowager, Tz’u-hsi, feeling threatened, and under the influence of a conservative coterie within the court, took the extraordinary move of placing the emperor under house arrest. She also ordered the detention and execution of the men who had advised him. But few ever excited as strong a degree of antipathy in Morrison as the Empress Dowager. He actually wrote in his diary in April 1899 that he had “often wanted” to see her killed. He understood the feeling to be mutual after, in the summer of 1900, her imperial guards not only failed to stop the murderous, xenophobic, and anti-Christian Boxer rebels from entering Peking, but appeared to aid them in their campaign of slaughter. Caught in the 55-day siege of the legations, he took active part in their defense and was badly wounded. Only the invasion of foreign troops ended the siege. Morrison had also lost his home in the conflagration. When it was over, the Empress Dowager and her court had fled Peking and the foreign troops led the looting of the Forbidden City. Morrison partook of the spoils, compensating himself for his losses and taking a bit of personal revenge on the Empress Dowager at the same time. We’ll return to war in a moment. But there was another battlefield that helped to define the changing landscape of Morrison’s world. Women in the West had begun to fight for suffrage, the right to own property and live lives of their own choosing. The creature known as “New Woman” was born. The most famous fictional incarnation of the New Woman was the Gibson Girl, the creation of illustrator Charles Dana Gibson in Collier’s magazine in 1902. A wildly popular model of young active womanhood, the Gibson Girl combined elegance and femininity with athleticism, character, and modernity. Then there was the real-life Alice Roosevelt, daughter of the American president. Alice, pretty and stylish, was so famously wild—firing pistols into the air at parties, smoking cigarettes, jumping into swimming pools fully clothed—that her father once famously said “I can either run the country or I can attend to Alice, but I cannot possibly do both.” For all her gumption, Alice could not herself have aspired to run the country—women in America didn’t have the vote. Even in forward-looking America, girls weren’t encouraged to pursue education or career. A young lady of good family’s first priority was to maintain what ladies magazines called “the citadel of their chastity” until such time as they could be marched across Hymen’s Altar by a suitable young man. Life was a bit different for the working classes. The factories of the Industrial Revolution in England and the United States had, with their voracious need for labor, produced a new class of independent working women. Those who took advantage of their freedom to live sexually liberated lives, sometimes mixing with poets and painters, were called grisettes in France for their grey dresses, and were known in America as “B-Girls”—bachelorettes and bohemians. Morrison had known more than a few grisettes, wild girls, and naughty wives in his time. But he had never encountered anything like the walking area of amativeness that was Miss Mae Ruth Perkins. 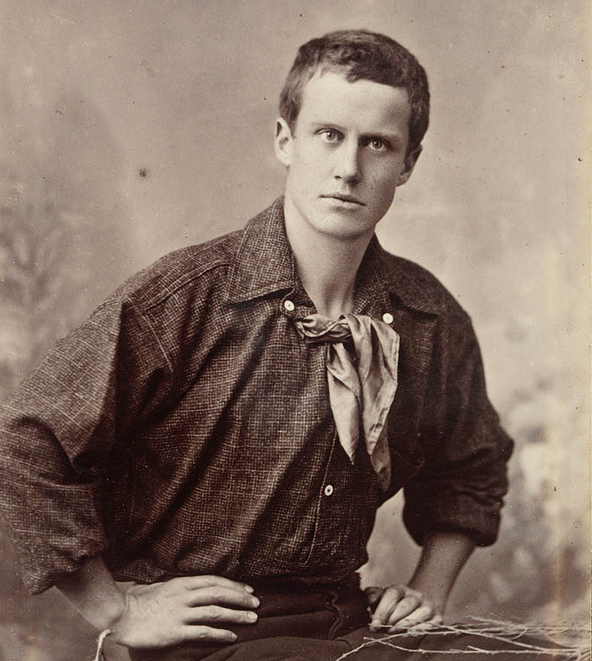 Mae, whom he called Maysie, romped into Morrison’s world in late 1903 and into his bed in early 1904. His was not the only bed she was prone to visit—and she freely shared with him and he, via his journals, with us, her considerable record of conquest, both past and concurrent. He was agonized and jealous, but seemed willing to put up with Mae’s antics so long as she kept him on her booty list. His diaries reveal that he wrote to her often, both letters and telegrams. He recorded the latter in his diary; all we know of the former is that they included one of the most “melting” love letters he composed in his entire life. My research assistant in California turned up stacks of love letters written to Mae by an impressive range of lovers before she arrived in China. Morrison mentions her reading to him from such letters, and the nosebleed it caused him. Sadly it seems Morrison’s own letters to her have been lost to posterity. While Morrison pursued Mae, his colleague Lionel James chased a dream. James was The Times’ star war correspondent. He’d reported from a number of fronts including the Second Boer War in Africa, where he was trapped in the Siege of Ladysmith. He’d had to rely on everything from pigeons to heliographs to get his dispatches from the battlefield to the pressroom. The sheer physical challenge of getting a report from the field past military censors and to a telegraph office meant it could take up to a month before it even reached the newsroom. Now that he was being sent to cover the Russo-Japanese War, James had a better idea: to employ the relatively new science of wireless radio transmission to make today’s battles tomorrow’s news. The transmitters were too heavy for a journalist who might be following an army on horseback. They required a trained operator, and a mast for receiving the signals that was not too far away. The Russo-Japanese War presented an ideal opportunity for wireless telegraphy, however, for in its early stages, it was prosecuted as a naval battle for control of Port Arthur, the commercially and military strategic town on the tip of Manchuria’s Liaodong Peninsula. James persuaded the editors at The Times to hire a boat, the SS Haimun, and fit it out with a transmitter, pay for an operator, and erect a mast in nearby Shandong at the British protectorate of Weihaiwei. There was one major catch: the Japanese navy had to agree or James’ efforts would literally be sunk. Morrison had respect and friends in high places in Japan. The mission seemed to hang on his ability to persuade both the Japanese and the wary British Admiralty back home that it was a good idea. In the end, The Times pulled the plug on what was an increasingly expensive and seemingly futile enterprise. But as Peter Slattery shows in his fascinating 2004 book, Reporting the Russo-Japanese War, 1904-5: Lionel James’s first wireless transmissions to The Times, the episode—and the few dispatches James did manage to send—is considered a landmark in the history of war correspondence. In hindsight, it’s easy to see how the Russo-Japanese War, which Japan won in 1905, paved the way for its full-scale invasion of China thirty-two years later. Though Morrison wouldn’t live to see that, he did come to change his opinion about Japan’s likely role in the region as a force for good. In 1911, the Qing dynasty was overthrown by republican revolution. Morrison, who considered himself a good strategic thinker, enjoyed respect among senior Chinese officials, and believed himself a solid friend of China, soon made another questionable call. Leaving journalism for a career as political advisor, he helped persuade the country’s new and still fluid leadership that of all the candidates for the republic’s first president, Yuan Shikai alone could win the confidence of the foreign powers. Yuan became president, and Morrison his advisor. Another Australian journalist who had become passionately invested in the question of China’s fate was W.H. Donald. Donald drafted Sun Yat-sen’s Republican Manifesto but like Morrison, had little faith that Sun, whom he called a “fool” in a letter to Morrison, could run the country. On the other hand, Yuan’s neo-imperial ambitions and excesses would soon leave Morrison doubtful that he had backed the right horse; he eventually professed himself “thoroughly disgusted” with his job. In early 1915, the Japanese presented to Yuan what are now known as the infamous “Twenty-one Demands”—demands Morrison later characterized as “worse than many presented by a victor to his vanquished enemy.” In the words of biographer Cyril Pearl, the demands “would . . . have reduced China to a vassal state.” The Japanese warned Yuan not to disclose any details to Japan’s ally Britain, or there’d be war. In the end, Morrison, who believed that “disclosure was China’s one safeguard,” persuaded Yuan to leak the contents of the document. It was a decision of momentous consequence. In mid-1919, long-simmering Chinese anger at both Japan and the collusion of foreign powers against Chinese interests erupted in the patriotic and culturally charged May Fourth Movement. In 1912, after several dalliances with other “immoral women,” Morrison married his young secretary, Jennie Wark Robin. After Yuan’s death in 1916, with the rise of warlordism, the collapse of central government authority, and so on, China grew ever more unstable. Jennie asked Morrison to move to England for the sake of their children’s education. For the next several years, Morrison maintained a punishing regime of travel, writing, and speaking around the world on behalf of the Chinese cause as he saw it. But his health was deteriorating. On May 27, 1920, the 58-year-old Morrison, weak, jaundiced, and suffering from acute pancreatitis, picked up his pen for the very last time. He wrote in his diary, “Almost can believe death struggle began.” He died just days later. That year, 1920, the U.S. Constitution was amended to extend universal suffrage to women. Wireless radio signals had truly revolutionized journalism: commercial radio was born. Airplanes, used to ferocious effect in the Great War that had only ended two years earlier, were poised to change the face of travel; in Australia, that year marked the founding of the Queensland and Northern Territory Aerial Services—QANTAS. The League of Nations came into being; the Russian Civil War ended. Women threw away their corsets and lifted their hemlines: flappers, It Girls, and all that jazz would mark the decade known as the Roaring ’20s. In China, bound feet followed the Manchu queue into extinction and in China too, girls had begun to be educated in numbers and a form of New Woman arose there too. It was in China in 1920 also that an inquisitive and strong-minded 26-year-old provincial from Hunan read The Communist Manifesto; one year later, Mao Zedong would attend the first meeting of the Chinese Communist Party. You may multiply the little facts that can be got from pictures & documents, relics & prints, as much as you like — the real thing is almost impossible to do, & in its absence the whole effect is as nought; I mean the invention, the representation of the old consciousness, the soul, the sense, the horizon, the vision of individuals in whose minds half the things that make ours, that make the modern world, were non-existent. You have to think with your modern apparatus a man, a woman — or rather fifty — whose own thinking was intensely otherwise conditioned, you have to simplify back by an amazing tour de force—and even then it’s all humbug. With regard to Morrison and A Most Immoral Woman, I suppose I can say that I did my best to write a novel that allows the reader to experience a taste of Morrison’s world—and Mae’s as well. As for the rest, like Peter Carey, I made it up.